The Baby Trend Stealth Jogger Travel System has it all! 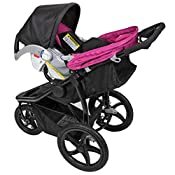 Designed with style, safety features and ease-of-use functions, this sporty Jogger guarantees a smooth ride for you and your little one, no matter where the destination. Made with high-quality fabrics and premium padding, the Stealth is an all-terrain jogger that makes travel hassle-free. 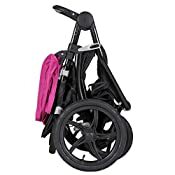 Equipped with an adjustable canopy and peek-a-boo window, this stroller also boasts a large basket for snacks and essential travel items, a parent cup holder and a swing away bumper bar for easy access in and out. It also features large 16-inch rear bicycle tires and a front swivel wheel that can be unlocked for low speed maneuvering. 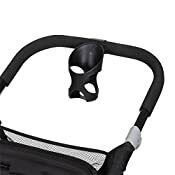 Lock the swivel wheel in place to transform this stroller into a fully functional Jogger. Also included is the Baby Trend EZ Flex-Loc 30 Infant Car Seat, specifically designed to keep your child safe and protected. 23.5"L x 48.0"W x 41.75"H recommended use: Stroller: Birth ~ 50 lbs. 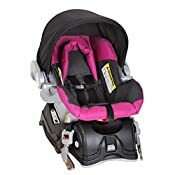 or 42",Car Seat: 5 ~ 30 lbs. and up to 30".